Orchids International introduces folding crates in solid wall and perforated wall version. Compared with common crate, the packaging volume of folding crates can reduce at least 70% after folding which is a big saving in terms of freight and space as both these parameters are a costly affair in current market scenario. 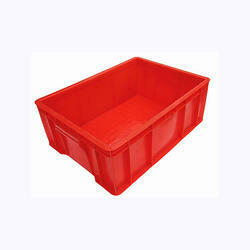 These crates are widely used in 24 hours chain supermarkets, convenience stores, large distribution centers for Automotive and Retail, department stores, light industry, clothing, home appliances, fruits and vegetables, food processing, and other closed loop distribution system and can realize mechanized handling, improve circulation rationalization & efficiency and also reduce storage and transportation cost. Looking for FOLDABLE SOLID WALL ?